Onward to Kyoto! 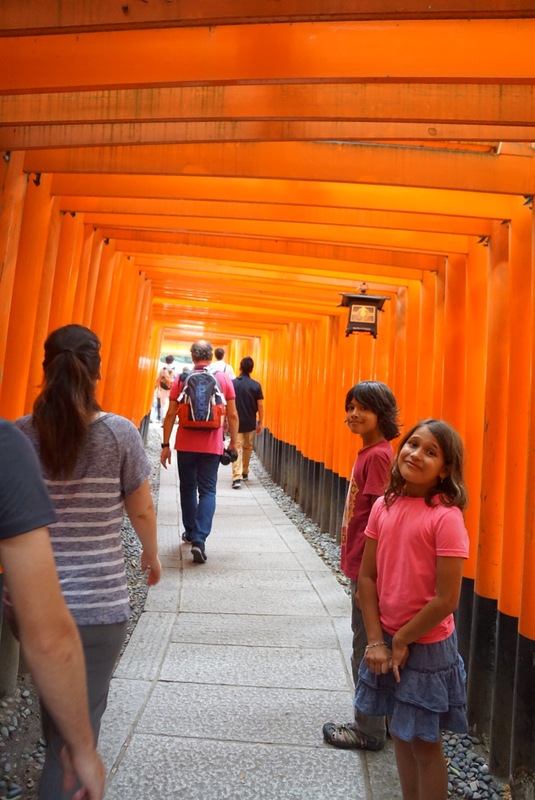 I wish I could tell you that I loved Kyoto and the beauty it had to offer. 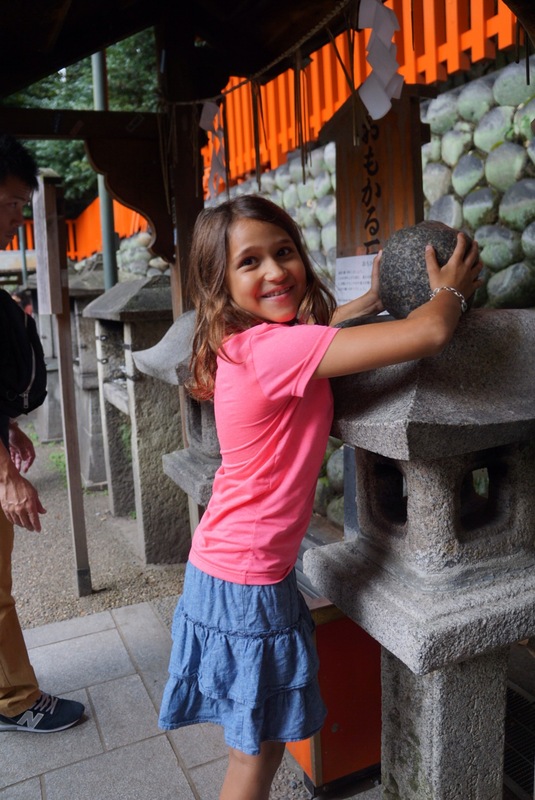 I did like a lot of what we saw, but the crowds made it so difficult to really enjoy things entirely, and there is a limit for how many temples and shrines one can see. We managed to get to our Air BnB, which was a bit outside the city and quiet. Dinner was at a udon place up the street. We ordered the Tofu Udon and soon realized our error. In the US, if a restaurant dish is tofu anything, you can be assured of it being otherwise meat free. In Japan, where tofu is considered palatable by everyone, this is not the case. Our udon arrived with big chunks of ham. We did our best to eat around them. 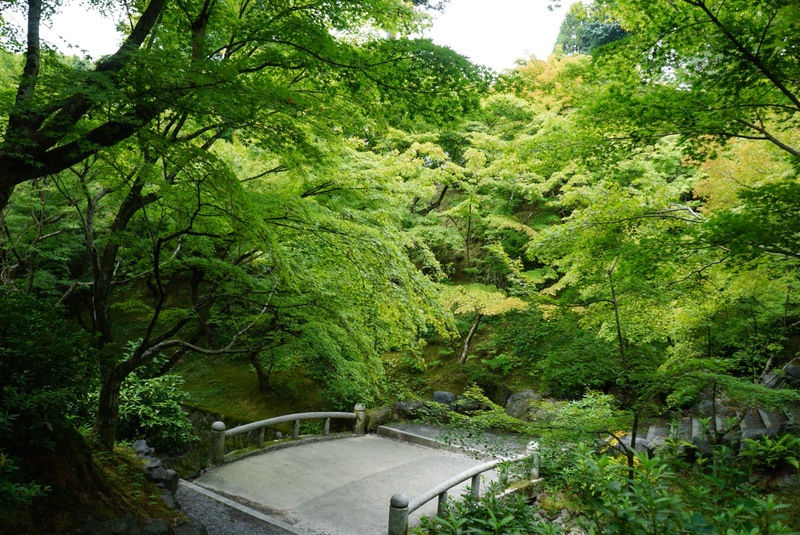 Kyoto is a land of temples and gardens and more temples and gardens. The former are lovely but get to be repetetive, the latter are stunning. 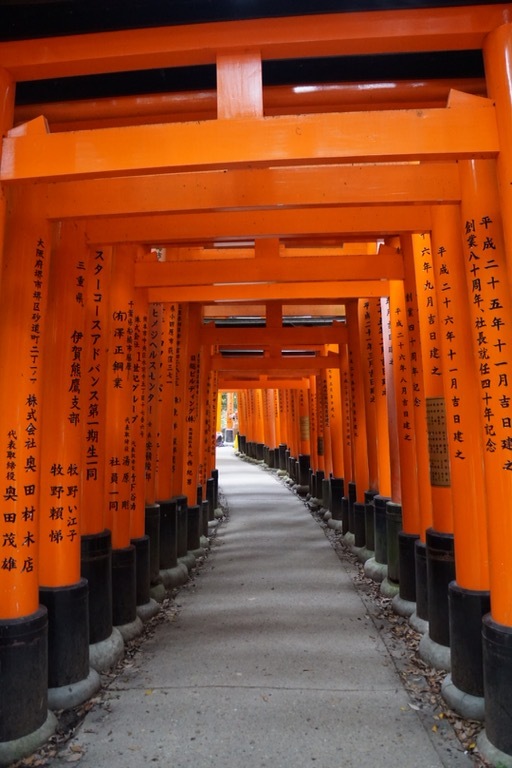 Our first stop, near where we were staying was the Fushimi-Inari shrine, known for the thousands of red gates. It should also be known for the thousands of tourists, local and foreign, that come to walk through. The path through the gates is narrow and steep and it was hard not to feel a sense of claustrophobia. From there we went to Tofukuji, another shrine (fine) but with truly beautiful Japanese gardens around it. One was a green garden and another was a Zen rock garden, both equally serene and so pleasant to walk around especially after the overload of the first stop. One restaurant I really wanted to go to was Kyotofu, a restaurant where they create and serve all things tofu! 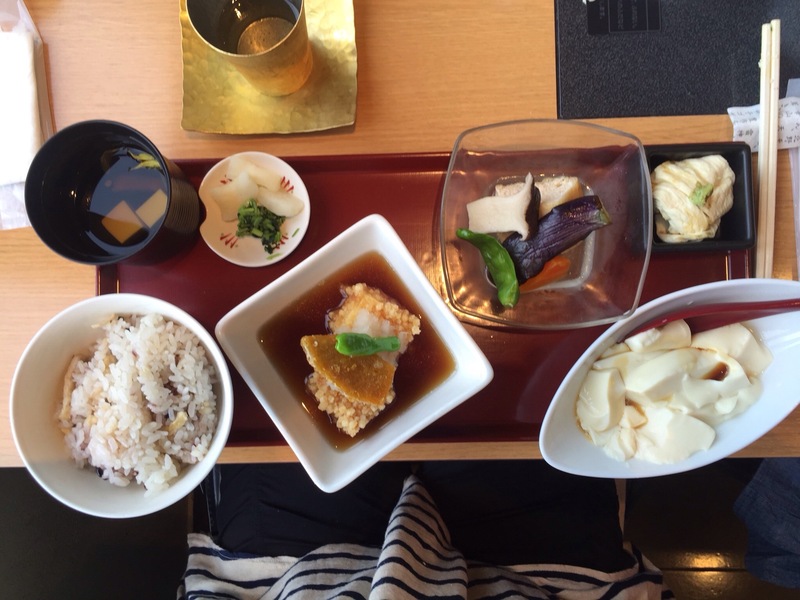 They specialize in many different types of tofu, and it’s a meal you just wouldn’t have in the states. Again, you’d think it would be vegetarian but no, we made sure to specify and good thing as two of the dishes in the set plate are otherwise made of hamburger. Mixed with tofu, of course. This was super tasty and we had a nice view of Kyoto as well. Quite differently than back home, this restaurant was in a shopping mall! This is pretty typical here – the entire top and bottom floors of shopping malls may be devoted to food, restaurants or grocery and are usually high quality. At a different mall, the downstairs two levels were like a Whole Foods on steroids. Just a little different from the Hot Dog on a Stick fare we’re used to at malls in the states. Another thing different about shopping malls here – there aren’t any walls separating the stores. The floors are sort of divided by theme – men’s fashion, women’s, kids – and then on the floors themselves are just, well, areas, the way we would think about different sections in a Macy’s, but each one is it’s own store with it’s own register. I’ve also yet to see a department store that isn’t completely packed with people. Who are all these people? Why do they shop so aggressively? Where do they put all this stuff? These malls are all very high end – think Chanel boutiques, Agnes B, Kenzo – and yet everywhere was full of shoppers, seemingly spending hard earned yen. The Gap of Japan is Uniqlo and Muji, and these were plenty full also. Eric continued his quest to find a pair of jeans, only to find that they either were long enough and cost $300 or came to his mid calf. 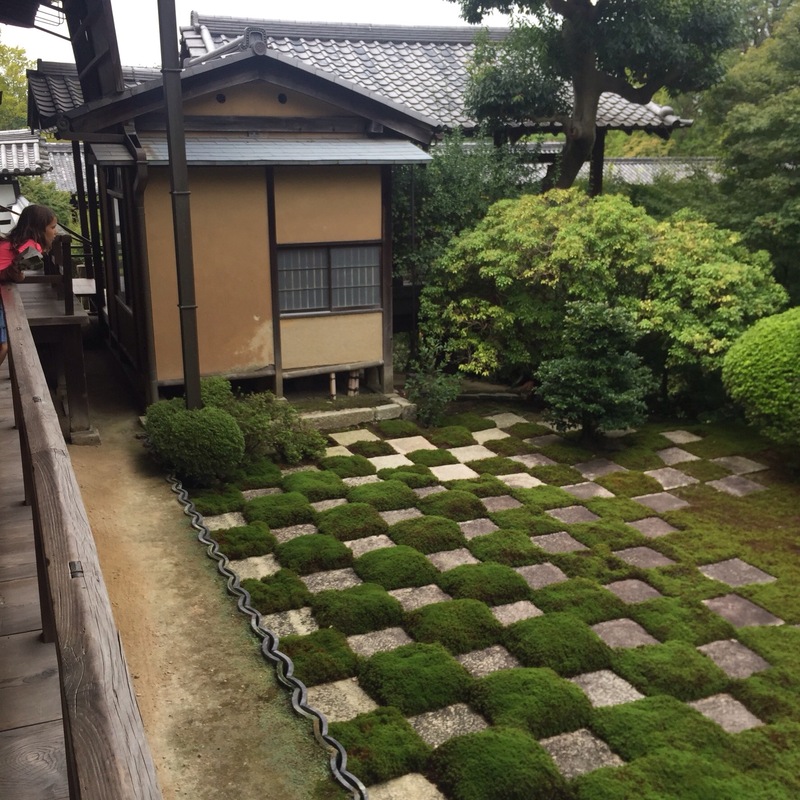 Our next day in Kyoto was cool and drizzly. 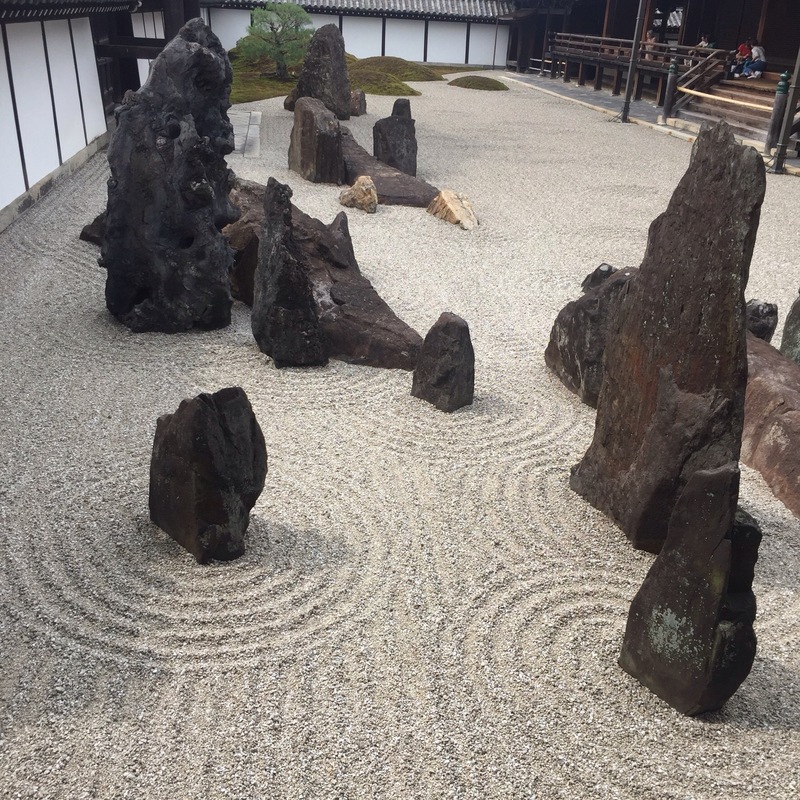 We had a late start and meandered to the Ryoan-ji, a zen rock garden. 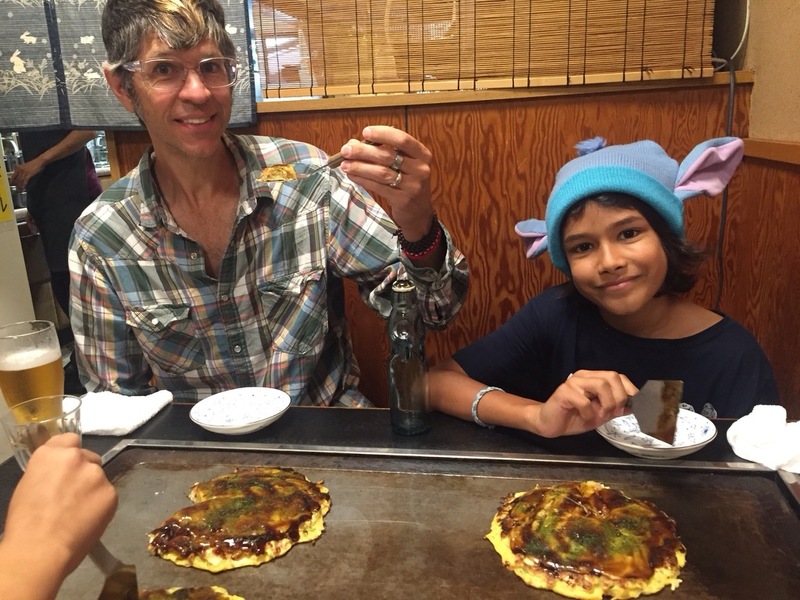 On the way we stopped in at an okonomiyaki, or japanese pancake place. They mix up veggies and meats in a base of egg and flour and cabbage, then cook it up. 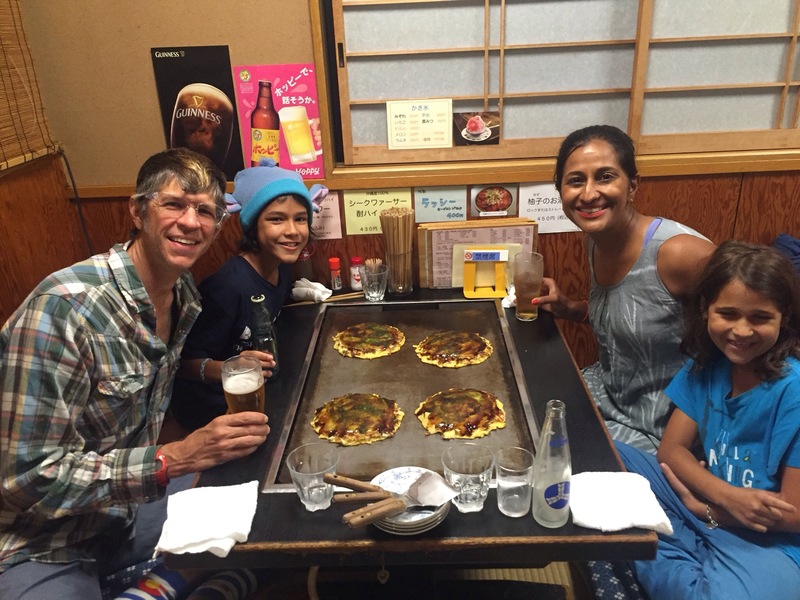 Your table has a narrow wooden rim and in the center is a rectangular grill, onto which the okonomiyaki goes. You eat it with a sharp spatula thing. I must say, this was my least favorite japanese dish. The pancake itself was tasty but I didn’t like the sweet teriyaki sauce on top. The rock garden was just beautiful, and afterwards we walked to Kinkaju, or the famous golden temple. Pretty though it was, it was so crowded that I felt like we were being herded along through the site. We are picky tourists, and want to enjoy these very popular sites with no one else around, I don’t think that’s too much to ask. I mean, if Obama gets to do it, why not us? Yeah it’s very easy to get tired of the shrines and temples in Kyoto- it’s best to mix it up with other things in town if you can! Still, looks like you managed to hit up some of the key places! 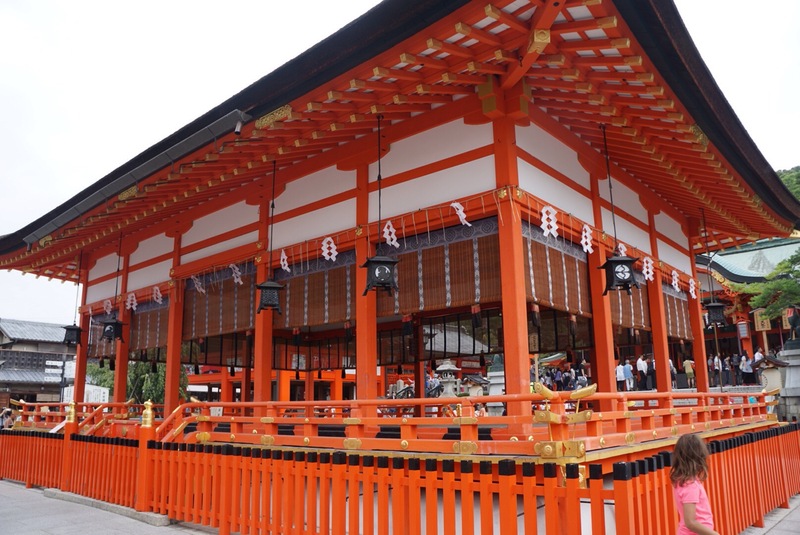 I think it was the combination of the shrine in Tokyo then Kyoto that did it, but they really were all so pretty! Love your blog too! Oh yeah that would do it! I think I’ve become desensitized to most shrines/temples now haha. Thank you so much, that’s very kind of you!